Rues the EC strictures, which prohibit posters on autos, among other things. Lack of funds is another dampener, compared to lakhs others are spending. Medha’s rallies are organised with the help of AAP volunteers and a ragtag group of locals she has worked with during movements she led in the past. Her slogans are derived from the rights tradition: ‘Hamein satta nahin, satya chahiye’; ‘Matya deya, hakka leva’. 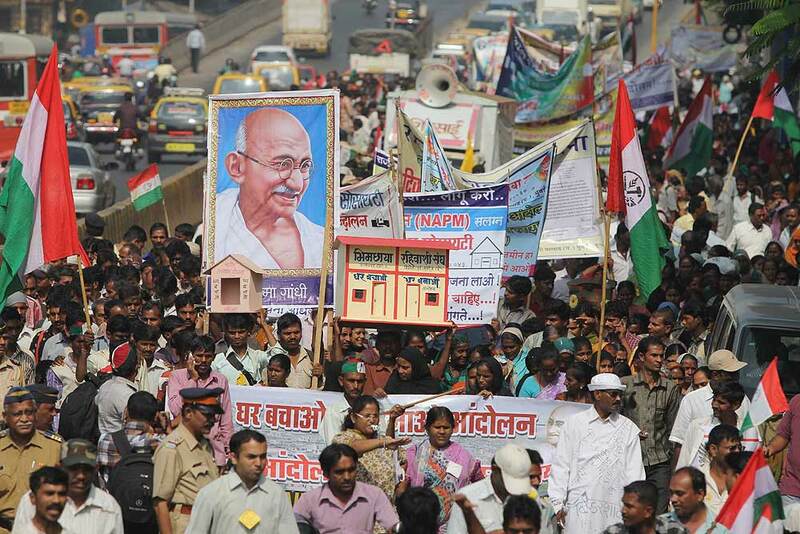 Long before the assembly elections in Delhi, long before Medha Patkar would contest elections from Mumbai North East and the Ghar Bachao Ghar Banao Andolan (GBGBA) would put its might behind their cause, Santosh Thorat waged an inner battle vis-a-vis the Aam Aadmi Party. A conflict that was visible, just about a year earlier, in an Irani restaurant in Bandra. 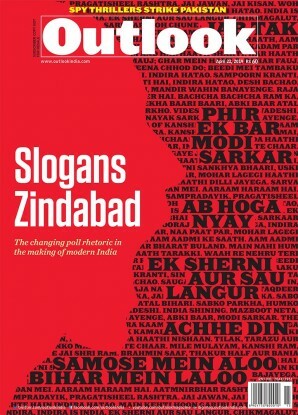 Would he want his politics—of strong, commu­nity-driven movements, women’s participation, Ambedkarite leanings, harking to a legacy going back to Bhagat Singh and Annabhau Sathe—to be diluted by bec­o­ming a footsoldier of a political party than remain a leader of the people? Thorat is one of the leading faces of GBGBA, a movement that was born out of Mumbai’s infamous demolition drives in 2004-05. Close to 80,000 homes were destroyed in Mankhurd, forcing its women to band together to resist the onslaught of the bulldozers. It was at this point that they reached out to Medha, who apparently told them that if they could get 100 women to fight, she would join them. The competition, of course, is unfair, especially when it comes to funding. The BJP has a front-page advertisement in the Times of India, which going by the daily’s rate of Rs 6,960 per square centimetre, would have cost Rs 11,942,360 (minus the 15 per cent discount) for the 1,716 sq cm front page space. Medha’s AAP donation website, by contrast, has collected a mere Rs 13,000 in the four days it went online. On the sixth day, a corporate lawyer from Calcutta made a contribution of Rs 1,00,000. Electoral rules have been another dampener. “We apparently can’t even put our stickers on autos,” she says, sitting in a small AAP office set up by a small restaurant owner in Vikhroli, amid the chatter of volunteers. “We say development planning has to be face-to-face, so how can electoral campaigning not be face to face?” Five young boys, who have come from Bheem Chhaya Nagar nearby, sit with drums which they were to play on Medha’s walks through the bastis. But this too has fallen prey to the EC’s injunctions, as the police did not give them permission to play in public. She’s up early, at five in the morning, planning her day and meeting volunteers before setting out on short rallies and more meetings, on the road, at parks, at crossroads and nakas, up small bylanes in slums, in small rooms and houses of supporters of GBGBA and now AAP. A motley bunch of volunteers, some from the grassroots and others who have come down from their buildings, from across the city and from across the country. On the road with her, it’s clear that in the lower depths of the city, it’s Medha’s simplicity that strikes a chord, as well as her infectious energy. At one such public meeting, in Rafiq Nagar 2, one of the crucibles of Ghar Bachao Ghar Banao Andolan, it’s almost a given, if bystander conversations are any window to wholesale voting patterns, that they would vote for her, even if they do not sit at the public rally where a thousand people, mostly unorganised workers, are sitting patiently, wearing the AAP topis young volunteers have distributed. 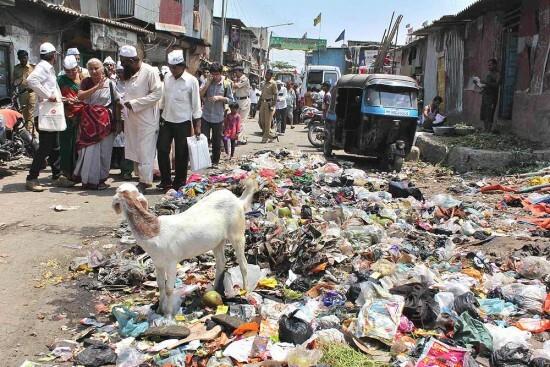 Rafiq Nagar is but one settlement in Mumbai’s largest dumping ground, where children die every other month of malnutrition-related diseases, where policemen routinely harass young Muslim boys, and which has faced demolitions almost every other year. Rafiq Nagar, citadel of ragpickers; Rafiq Nagar, when it was still Rafiq Nagar 1, where some boys have still not come home after the 1992 riots. Proceedings begin with Lok Shahir Milind Kambli from Mulund singing a rendition of Sambaji Bhagat’s Surat ko pehchano bhai, a song that attacks caste as much as corruption, that invokes Ambedkar’s dream, ridicules every political figure—from Advani to the Gandhis—and laments the blindness of those who ran after the ‘mandir’. The one thing AAP has done for GBGBA, whether as a blessing or curse, is bring in volunteers from the upper middle clas­ses, the middle classes and upper castes or Savarnas, to areas once populated by the working class, the urban poor, and those who have grown up in the tradition of Ambedkar politics. Medha’s rallies at more suburban middle class areas are organised often with the help of AAP volunteers and a ragtag group of locals she has worked with in the movement. The slogans that she invokes come typically from a rights tradition: ‘Hamein satta nahin satya chahiye (We need truth, not power)!’ and ‘Matya deya, hakka leva (Give your vote, take your right’). Yes, there was dissent in the National Alliance of People’s Movement against her decision to stand, from “a handful of people,” as she says, mostly from Assam, Karnataka and some units from West Bengal. But the idea was to make electoral politics complementary to non-electoral politics. Medha often emphasises the role of social movements in shaping policy and law. Her vision of development is motivated by that forgotten lesson in civics textbooks: the Directive Principles of State Policy. These guidelines in the Consti­tution, envisaging a more equitable development that paid equal heed to ecology, environment and social justice, have remained so, ignored by most state and Central governments. There is much she wants to say, and at the end of an interview I am having with her on the sidelines, she chooses to ans­wer a question I ask in English in Hindi, to include her eagerly listening volunteers. The interview explodes into a conversation, between AAP and GBGBA, about the suitability of certain slogans, about the importance of Ambedkar’s birth anniversary, about those who feel the Lokpal is against the Constitution and therefore against them. These people must be spoken to. Over the ruckus, an elderly aap volunteer announces that ‘Vande Mataram’ is the same as ‘Jai Bhim’. No one pays him attention.